A joint study by the University of Exeter, Rothamsted Research and Bayer AG has discovered the enzymes in honeybees and bumblebees that determine how sensitive they are to different neonicotinoid pesticides. The potential impact of neonicotinoids on bee health is a subject of intensive research and considerable controversy, with the European Union having restricted three compounds on crops that are attractive to bees in 2013. However, both honeybees and bumblebees exhibit profound differences in their sensitivity to different members of this insecticide class. The researchers aimed to understand why this is, in order to aid the development of pesticides that are non-toxic to them. Just as in other organisms, toxins in bees can be broken down by enzymes called cytochrome P450s. The study identified one subfamily of these enzymes in bees -- CYP9Q -- and found it was responsible for the rapid breakdown of certain neonicotinoids. 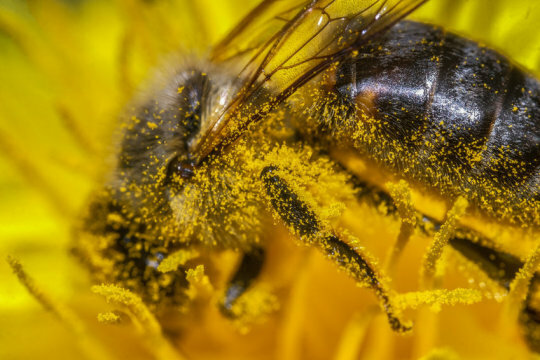 "Identifying these key enzymes provides valuable tools to screen new pesticides early in their development to see if bees can break them down," said Professor Chris Bass, who led the team at the University of Exeter. "It can take a decade and $260 million to develop a single pesticide, so this knowledge can help us avoid wasting time and money on pesticides that will end up with substantial use restrictions due to intrinsic bee toxicity." Dr Ralf Nauen, insect toxicologist and lead investigator of the study at Bayer added: "Knowing the mechanisms contributing to inherent tolerance helps us and regulators to better understand why certain insecticides have a high margin of safety to bees." "The knowledge from our study can also be used to predict and prevent potential harmful effects that result from inadvertently blocking these key defence systems, for instance by different pesticides (such as certain fungicides) that may be applied in combination with insecticides." Professor Lin Field, Head of the Department of Biointeractions and Crop Protection at Rothamsted Research added: "Some neonicotinoids are intrinsically highly toxic to bees but others have very low acute toxicity, but in public debate they tend to get tarred with the same brush. "Each insecticide needs to be considered on its own risks and merits, not just its name." The researchers carried out the most comprehensive analysis of bee P450 detoxification enzymes ever attempted. Comparing the effects of two neonicotinoids, they found bees metabolise thiacloprid very efficiently, while they metabolise imidacloprid much less efficiently. Although previous work had suggested rate of metabolism might explain why bees react differently to different neonicotinoids, the specific genes or enzymes were unknown until now. The research was part funded by Bayer, which is a manufacturer of neonicotinoid insecticides.